On paper, Wonder sounds almost insufferably treacly. 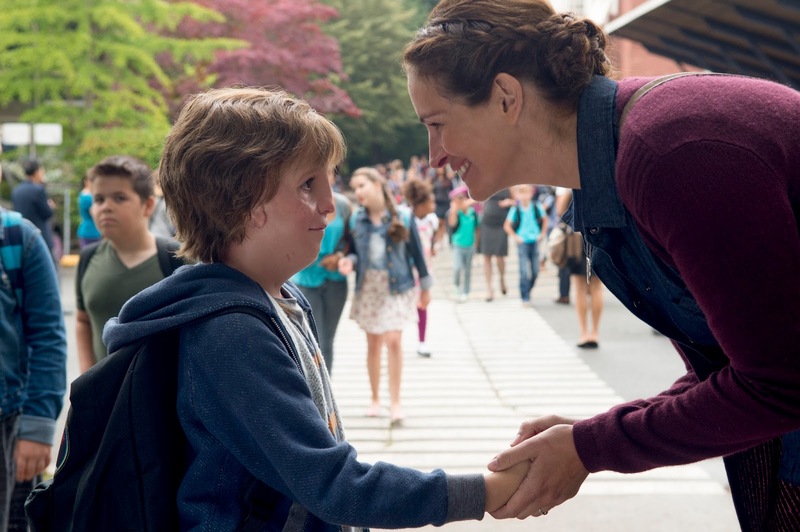 The story of a young boy with a facial deformity overcoming adversity and constant bullying in a new school, everything about it just seems ripe for the kind of mawkish pablum that often characterizes these kinds of inspirational dramas. 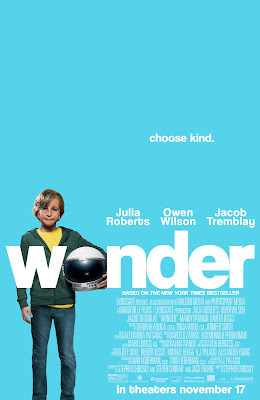 However, in the hands of director Stephen Chbosky (The Perks of Being a Wallflower), Wonder is actually a sensitive and sincere tear-jerker with real heart. August Pullman (Jacob Tremblay) was born with a chromosomal defect that resulted in a facial deformity, requiring multiple plastic surgeries in order to see and hear properly. Embarrassed by his unusual looking face, he usually hides behind an astronaut helmet, until the day comes for him to leave homeschool and head to 5th grade. Already advanced for his age, especially in science, Auggie quickly takes to the subject matter, but he is constantly targeted by two-faced bullies who go unnoticed by the adults around them. As he begins to open himself up and make friends, he starts to realize that the world can often be cruel, and children even crueler. Through the support of his family, his newfound friends, and his irrepressible spirit, Auggie must overcome his perceived flaws and self doubt and show the world how strong he truly is; teaching everyone he encounters to choose kindness. Sure, it's sentimental, but never shamelessly so. Chbosky earns the audience's tears by drawing real, fleshed out characters and exploring each story with dignity and grace. "There are always two sides to every story" Auggie's principal says at one point. And in that spirit, Wonder shows us that everyone has their own story to tell. Chbosky goes in-depth to explore each character's motivations, showing us how Auggie's older sister, Via (Izabela Vidovic) often feels neglected by the amount of time their parents spend with him; why Auggie's best friend seemingly betrays him in order to fit in with the "cool" kids; and why Via's best friend, Miranda (Danielle Rose Russell) suddenly stops hanging out with her. Each one gets their moment in the spotlight, highlighting the fact that we never know what private struggles people are dealing with under the surface. It gives each character depth and agency in their own stories, deftly exploring the idea that there are indeed two sides to every story, and unseen pain often lurking just beneath the surface that we may never know about. "Choose kind" is the film's tagline, and it reinforces that at every turn without coming across as pushy or manipulative. The earnest performances by its cast, especially by Tremblay, who remains one of the best young actors out there today, also help sell its tricky story. This could easily have been a cloying and sappy film, but it is a testament to Chbosky's skill as a director and screenwriter that it isn't. Wonder is instead a tender and truly moving heart-warmer that comes by its tears honestly. Rather than delve into flagrant schmaltz, it makes a quiet and stirring plea for pure human decency. In a world where bullying now seems commonplace, even from the highest office in the land, and kindness feels like a lost art, what could be more wonderful than that? WONDER | Directed by Stephen Chbosky | Stars Julia Roberts, Owen Wilson, Jacob Tremblay, Mandy Patinkin, Daveed Diggs, Izabela Vidovic, Sônia Braga, Ali Liebert, Noah Jupe, Millie Davis | Rated PG for thematic elements including bullying, and some mild language | Opens today, 11/17, in theaters nationwide!